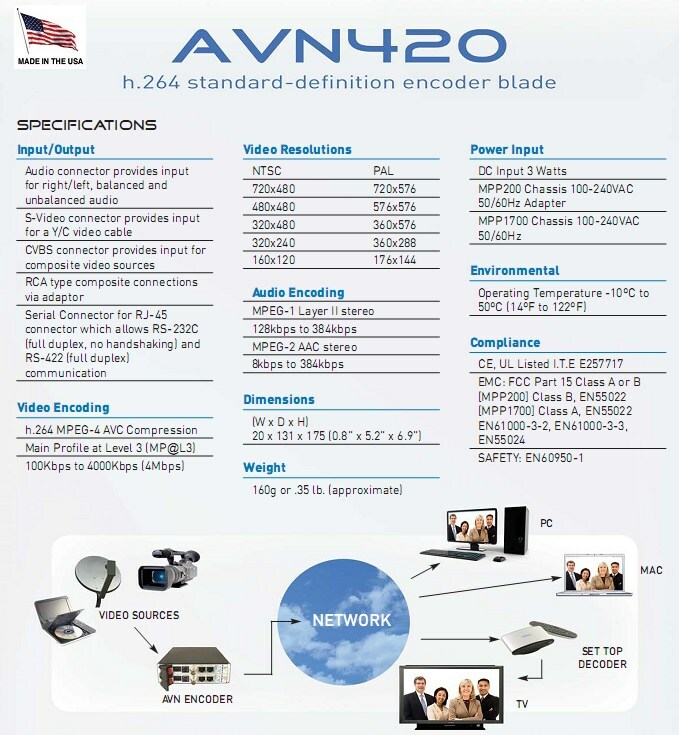 AVN420 – H.264 (MPEG-4) SD Video/Audio Encoder with Composite and S-Video inputs, IP output | AdvancedDigital Inc.
LAN or WAN. The MPP with AVN420 blades is suitable for all applications requiring cost-effective, low bit rate, standard definition video distribution over IP networks. The AVN420 IPTV encoder can turn video from any composite or S-video source into full-screen, full resolution Internet Protocol digital video in real time. viewed by an unlimited number of clients on a LAN or WAN with 25fps PAL or 30fps NTSC assured, provided that bandwidth is available. Image resolutions are configurable from D1 (720×480 NTSC, 720×576 PAL) down to 160×120. The video bit rate can be configured from 100 kbps to 4 Mbps. The audio compression is either AAC or MPEG-1 Layer 2 audio encoding at 8 to 384 kbps with up to 48 KHz sample rate. The AVN420 includes one BNC composite input and one S-Video input for connecting video source equipment. A terminal block connector provides audio inputs for Balanced and Unbalanced connections. This allows for easy onsite connections regardless of the cabling outputs of the audio source. The AVN420 features user control of audio parameters, including mute, pre-amp and volume. The AVN420 includes a serial connection via an RJ-45 connector. This connector can be used as an RS-232 port (fullduplex, no hand shaking) or an RS-422 (full-duplex) port. These ports allow the AVN420 to interface with external devices such as terminal emulation equipment. 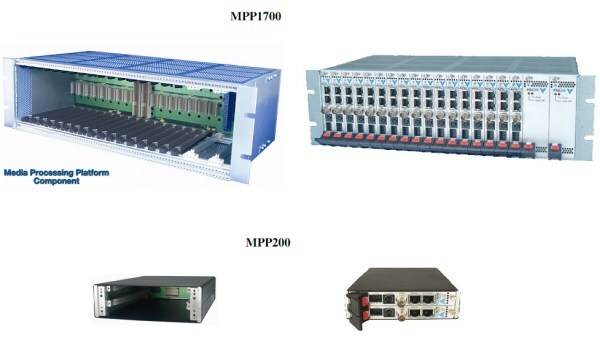 The MPP1700 Multi-slot chassis with power supply module will hold up to seventeen AVN420. The MPP200 chassis with external power supply can hold one or two AVN420.